When working with BoldGrid, you will need a unique connect key. This key identifies your account and is used to activate the BoldGrid suite. It also is used in conjunction with your BoldGrid Coins account. 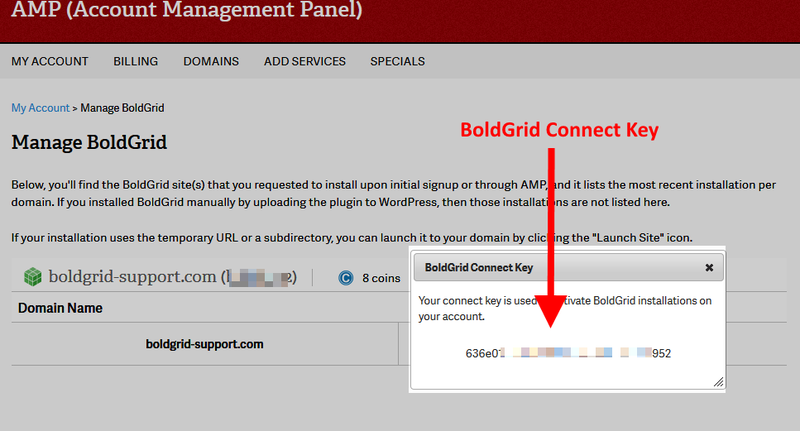 If you install BoldGrid using the installation tool in the AMP (Account Management Panel) you likely will not even see the key during the process. But, if you do a manual install you will need to find it. Below we show you how to find it within your AMP. We will also tell you how to get the connect key if you have manually installed BoldGrid. Log into your AMP (Account Management Panel) dashboard. Look under the Manage My Account section and click on the Manage BoldGrid icon. On the Manage BoldGrid page, locate and click on the View Connect Key link. A popup will appear that contains your BoldGrid Connect Key. 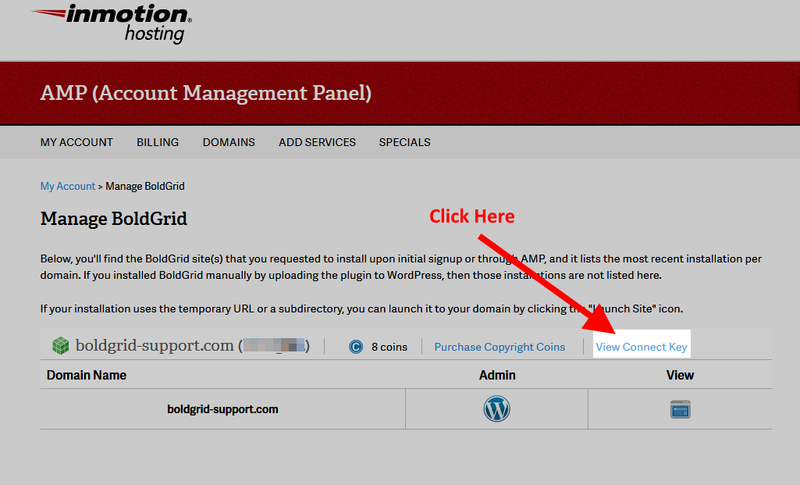 Look under the Manage My Account section and click on the Install BoldGrid icon. 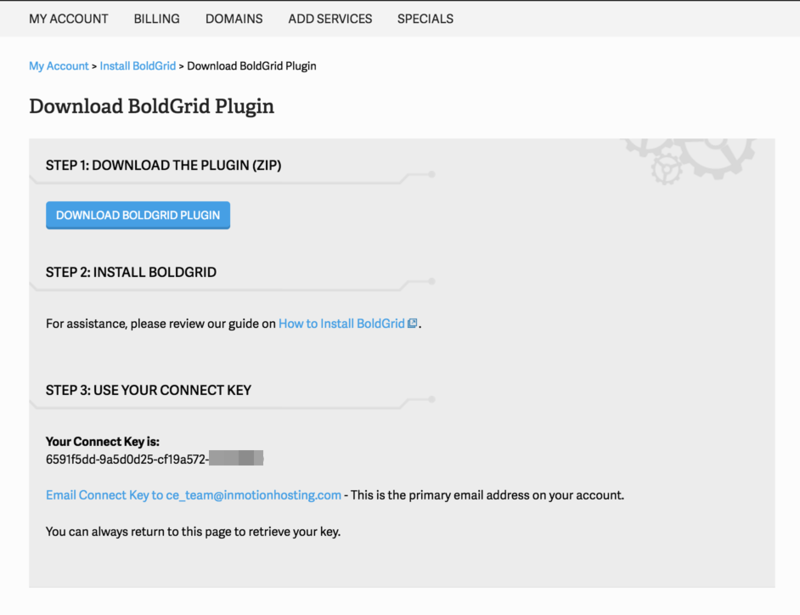 After you clicked on the Install BoldGrid icon you will see three setup options for BoldGrid. Click on option #3 - I already have a WordPress site. Here you will see three steps. You will find the Connect key under Step 3. Congratulations, now you know how to get your BoldGrid Connect Key! Greetings, I obtained the Connect Key by following the steps in the tutorial, however, BoldGrid is telling me that the Key that I was provided is the Standard-type rather than a Premium Connect Key, which is locking me out of certain features that I need. Who do I need to talk to get this issue corrected? You can either talk with the technical support team or sales team (from InMotion Hosting), or contact BoldGrid directly to obtain a premium key. Which step in the process are you experiencing issues with? We are always happy to help! If you are an InMotion Hosting customer, you can contact our Live Technical Support team for assistance. For the second time, on a second machine, I am locked out of my BoldGrid which also locks me out of the ability to get to my site to do ANYTHING!!! Any machine that I have saved my BoldGrid password to, within a few months, does this! When I manually type in my web domain/admin-wp, the '/admin-wp' turns a light gray in the address line while my domain address remains the usual black and then displays a message on my screen 'the page is unavailable'. Went through several different support techs and remedies with my Laptop this summer to no avail and they finally told me it couldn't be fixed and to wipe my Laptop completely. Which I finally did. It is becoming clear that it has to do with saving the password so I don't have to type it in everytime. Anybody else have this problem? If so, were you able to 'fix' it' without wiping your entire machine?!!! I'm sorry to see this is happening. From your description it seems like the password manager is causing an issue. Are you using a third party password manager or a particular internet browser to manage your passwords? I have a premium connect key in my Boldgrid Central account. Can I use it to upgrade my free version installed by you guys when i purchased my hosting account. You can use the Premium Connect Key you purchased from BoldGrid Central, indeed. You can use the guide on BoldGrid's Support site to learn how to update your BoldGrid Connect Key. If you were provided a free key from InMotion Hosting, it is a Premium Connect Key. Either one may be used, however, keep in mind, any purchases made in BoldGrid Central are associated with your Connect Key. I keep getting, "Your API key appears to be invalid!" for BoldGrid. I've used the Connect Key copy/paste from the Manage BoldGrid and also did a request and did a copy/paste from the email. Same issues for both. Any ideas? You need to reach out to support and they will be able to help you. How can I edit image in the boldgrid because the insert image icon is not working. also the existing pictures are not editable. Sorry for the issues with editing the images. We would need more specifics in order to determine what's happening. Have you updated to the latest versions of WordPress and BoldGrid? Can you please explain in detail the images you're trying to edit and the steps that you're taking so that we can attempt to duplicate the problem? During the initial installation, in your WordPress admin area, you should see an option to request a key which will be emailed to a preferred email address you can provide. If you have installed it using the Install Popular Software and it does not show, you can still see it. Go back to the Intall Popular Software and click on "Install Boldgrid". Select the third option. You will see the key there. Do I need a unique BoldGrid key for each separate website I am running? Or can I use the same key for separate installtions on two completely separate sites? I would keep the installations separate using different keys. That way if anything arises, it helps to distinguish between the two websites on our side. BoldGrid does not appear under "Manage My Account" After 5 or 6 installs. No BoldGrid icon nor an email to the email account on record about the install. Is this not part of my plan? Do you have Boldgrid set up for multiple cPanel accounts, or for the same cPanel but different domains or subdomains? If Boldgrid does not appear under "Manage My Account" - does that mean I cannot get Boldgrid? - is it free for existing customers? That icon should appear after you install BoldGrid from the Install Popular Software option in your AMP. 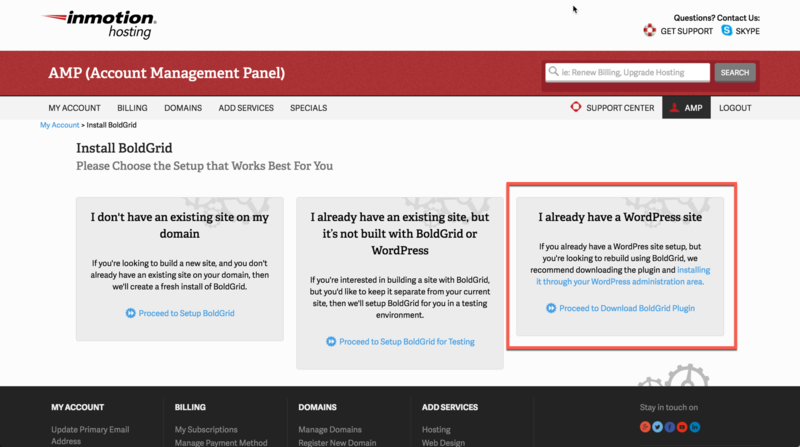 I installed WordPress with BoldGrid but that icon still does not appear. You guys really need to fix that and make that work correctly, or edit this info. This information is not helpful. How do I get the key for real? And is it the premium key with full access to the features of BoldGrid? Sorry for the problem with getting your connect key through the AMP interface. If you're not seeing the interface there, please contact our support team if you are an InMotion Hosting customer. If you are not, then you will need to contact BoldGrid support by going to their Support page. If you have a BoldGrid Central account and you have purchased a premium key, then you can also find it there. I'm also not seeing that BoldGrid icon and cannot manage it from my AMP either. Further it won't recognize a premium key. Sorry to hear about the trouble you are experiencing. Please contact our Live Support team so they can test your specific account.